The Department of Veterans Affairs (VA) has finalized a rule for presumptive service-connection of eight diseases associated with contaminants in the water supply at Marine Corps Base Camp Lejeune between 1953 and 1987. 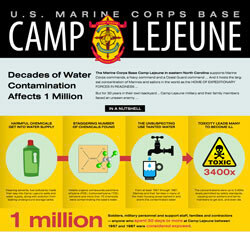 Learn more about the groundwater contamination at Camp Lejeune. The VA addressed contamination of water supplies at Camp Lejeune by four chemicals of interest – trichloroethylene (TCE), perchloroethylene (PCE), benzene, and vinyl chloride. The water contamination was determined to be a result of on-base industrial activities and an off-base dry cleaning facility. Other contaminants, including possible lead contamination, toxic mixtures, or contamination by other toxic chemicals were not included. The VA did not accept all of the diseases covered by VA health care as presumptive service-connected for disability compensation, instead narrowing the list to only eight diseases. While limited, the final rule is still a major step forward in providing disability compensation for qualifying veterans, former Reservists and former National Guard members who have been affected by the diseases. It’s important to note that the new rule does not apply to any family members who may have lived on the base during the time frame covered by the rule. The final rule, available on federalregister.gov, is scheduled to be effective March 14, 2017. There is no date by which these diseases must manifest. Of note: Eligibility for presumptive service-connection is not established for those veterans, former Reservists, or former National Guard members who served aboard vessels that docked at Camp Lejeune unless military orders or other official service department records reflect service at Camp Lejeune. In this case, service-connection for any disease or disability must be established on a direct basis. Claims Impacted: Disability compensation claims filed with the VA on or after March 14, 2017, and claims pending before the VA on that date. No retroactive provision is included in this regulation change. If a claim was previously and finally denied, a new claim to obtain a presumptive service-connection based on a new determination of entitlement under the final regulation at 38 CFR 3.307 (a)(7) must be completed. The VA concluded insufficient evidence for service-connection for the following diagnosed chronic disabilities listed in the Camp Lejeune Act. Veterans diagnosed with these health conditions or diseases have access to VA health care, but are not presumptively service-connected for the purpose of disability compensation. After the proposed rule was published in the Federal Register on September 9, 2016, the VA received 290 comments. Read the comments, the VA responses and the entire final rule at https://federalregister.gov/a/2017-00499.